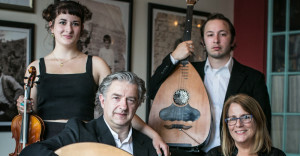 Drómeno returns to the Red Poppy with Turkish-influenced tunes from Asia-Minor, featuring oud, kanoun, violin, and vocals. This nostalgic music came with refugees from Smyrna, and the sounds are shared among other formerly Ottoman-occupied lands, like Macedonia, as well as the Sephardic Jews of this area. Joined by special guest percussionist Sean Tergis, the first half of the evening will be a sit-down concert, then the floor will be open for some lively regional Greek music for dancing! Made up of the Govetas family, Drómeno is well-versed in subtle and distinct regional music from musically rich Greece, as well as other areas in the Balkans. In 2017, Christos Govetas and Ruth Hunter received the Gordon Ekvall Tracie Award, which recognizes an ethnic performing artist(s) for excellence in ethnic performance and for his/her significant contributions to the development and presentation of the traditional cultural arts in the Pacific Northwest.